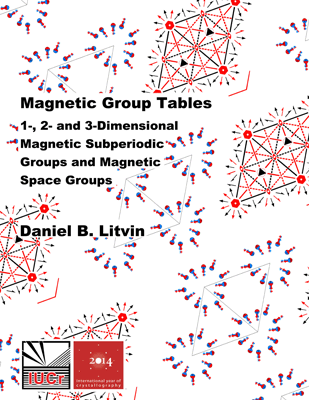 This PDF format e-book tabulates the structure, symbols and properties of magnetic groups. A survey of magnetic group types is presented, listing the elements of one representative group of: (i) the 5, 31 and 122 types of groups in the reduced superfamilies of the 1-, 2- and 3-dimensional magnetic point groups, respectively; (ii) the 31, 394 and 528 types of groups in the reduced superfamilies of magnetic subperiodic groups, i.e. magnetic frieze groups, magnetic rod groups and magnetic layer groups, respectively; and (iii) the 7, 80 and 1651 types of groups in the reduced superfamilies of 1-, 2- and 3-dimensional magnetic space groups, respectively. Tables of properties of the 1-, 2- and 3-dimensional magnetic subperiodic and magnetic space groups are given. Opechowski-Guccione and Belov-Nerenova-Smirnova magnetic group symbols are compared, and maximal subgroups of index less than or equal to 4 are listed.